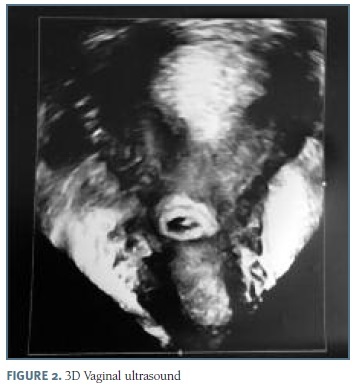 The authors present a clinical case of a young healthy woman with a caesarean scar pregnancy, emphasizing the relevance of an early ultrasound diagnosis. Keywords: Ectopic pregancy; Caesarean section; Pregnancy complications; Ultrasonography. A33-year-old healthy woman presented to our emergency department with pelvic discomfort and six weeks of amenorrhea. She had a caesarean delivery ten years earlier and an early pregnancy loss with need to perform curettage six months before. She had no vaginal bleeding and an unremarkable clinical exam. 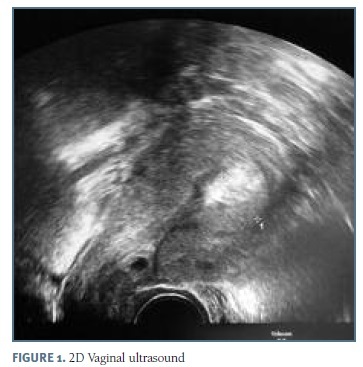 The vaginal ultrasound revealed an enlarged uterus, a fundic endometrial thickening and a hypoechoic structure with 6 mm of diameter at an isthmic level overlying the caesarean scar compatible with a gestational sac, and normal adnexa (Figure 1). The 3D view confirmed the presence of a gestational sac with a yolk sac and an embryonic pole at an isthmic level (Figure 2). sections but also the improved diagnostic capacity and higher index of suspicion2. The clinical presentation may vary widely from asymptomatic to catastrophic bleeding1. The best diagnostic tool is the vaginal ultrasound, which can show an empty uterine cavity, a gestational sac located in the isthmic anterior uterine wall overlying the caesarean scar, a thin myometrium between the sac and the bladder, Doppler evidence of prominent vascularization and an empty cervical canal. An early and prompt ultrasound diagnosis is critical for a good outcome3-5. 4. Timor-Tritsch IE, Monteagudo A, Cali G, El Refaey H, Kaelin Agten A, Arslan AA. Easy sonographic differential diagnosis between intrauterine pregnancy and cesarean delivery scar pregnancy in the early first trimester. Am J Obstet Gynecol 2016;215(2): 225.e1-7.